Turquoise Moon | Vineyards to visit in our part of France. 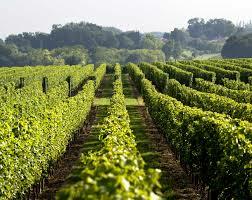 Vineyards to visit in our part of France. 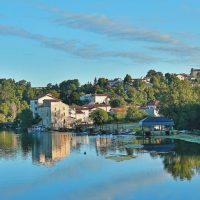 The Charente-Maritime and Charente “departments” (like counties or areas) are situated in south-west France, and boast a wonderful climate, especially close to the coast. Indeed, the weather can sometimes change quite dramatically once you are 12 kms inland, with beautiful sunshine near the coast and bucketing rain further in. Traditionally, they are not the best-known of wine regions simply because their vineyards – until relatively recently – were geared more towards cognac than wine. Yet, as regional wines go, the products are good. 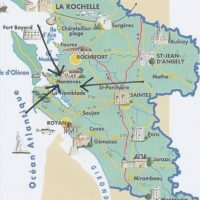 Indeed, some consider that these two areas produce some of the French Atlantic coast’s very best wine. Some have won awards. Between them the two Charentes have thousands of hectares of vines. The Atlantic coast islands the Île de Ré and the Île d’Oléron both produce very good wine, and vineyards continue south from Angouleme in the east almost as far as the beach resort of Royan. Local wines were until quite recently known as Vin de Pays, meaning wine from the local land. Under EU changes in regulations in 2009, local wines are now (technically at least!) known as Indication Géographiques Protégée (IGP) (in English this is Protected Geographical Indication). However, the wines grown here can use this classification or continue with the name Vin de Pays – or use both! IGP is just a quality control labelling system that ensures that you know what you’re buying. IGP wine has to comply with certain rules, such as where it is made, what the maximum yield is and the types of grapes that can be used. 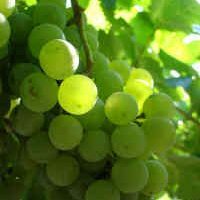 For a long time Charentais wine makers grew only the white wine grapes that locals had always grown, as these grapes varieties are used to make the region’s most famous drink, cognac. The more aromatic grape types such as Chenin, Chardonnay and Sauvignon have now been established, along with red and rose – Merlot, Gamay, Pinot Noir, Cabernet-Franc and Cabernet-Sauvignon. 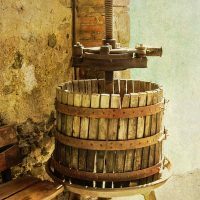 The making of wine in the two Charentes goes back a long way. It was probably in about the third century AD that the Gauls – who had been heavily influenced by the Romans – began planting vines in this area, the tradition having spread from the Mediterranean region of France (where wine-making dates back to the 6th century BC or earlier). Local residents, merchants and growers had all realised that the area’s fine climate was suitable for vines. 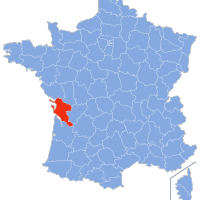 Initially wine-making was restricted to what is called the Saintonge, the historic area around the town of Saintes, that covers the southern and western parts of the Charente-Maritime. 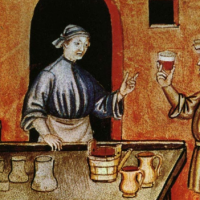 It was not until the Middle Ages that wine-making became ‘big business’ in the region. Eleanor of Aquitaine (the Aquitaine region now covers the Bordeaux wine region and further south but at that time covered the whole of what are now the Charente and Charente-Maritime departments too) and her husband, Henry II of England. Their marriage boosted trade links between England and Aquitaine, and wine from the area became popular across the Channel … so more and more vines were planted. The River Charente played a key role because it was used to transport wine from the producers to ships – and the ships would export it. The trade and the quality of the wine increased and improved. 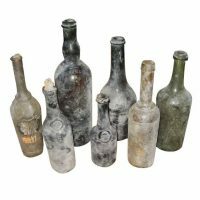 By the 15th century Dutch merchants (who came to this part of France because of the local salt) were exporting considerable quantities of wine, not just to Holland but to Scandinavia and England. By the 17th century wine from this area achieved growing recognition across France. More and more vines were planted, causing overproduction in some cases. This period also coincided with the rise of what became cognac – white wine that is distilled twice to become a distinctive brandy. By the 19th century there were 100,000 hectares (just under 250,000 acres) of Charentais vineyards producing four million hectolitres, or more than one hundred million gallons of wine. This represented about one twentieth of France’s entire production of wine. But then disaster struck. 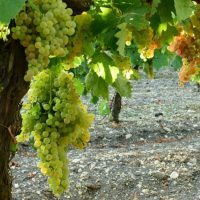 In common with other areas in France, and Europe as a whole, this region’s vines fell victim to the dreaded phylloxera insect which attacks the plant’s roots. The effect on Charentais wine was catastrophic; the number of hectares of vine dropped from 100,000 to around 8,000 by the end of the century. It would take almost a hundred for the vineyards to recover. When it did resume on a larger scale, Charente vine-growing was almost entirely devoted to making cognac. Charentais wine itself had more-or-less died out. In the 1970s local growers sought to diversify. It was time to bring the proud name of Charentais wine back. By 1981 a modest but healthy 2,000 hectares of vineyards were once again dedicated to making wine, and the quality grew all the time. At the 2013 Paris show five Charente white wines were awarded gold, with two rosé wines also earning gold. The red, at one time headache-stuff, is now perfectly acceptable – indeed, really very good. 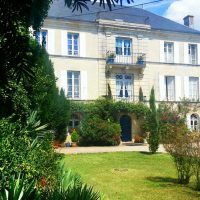 A “chateau”, where wine is concerned, can simply be a building of any sort. Our own chateau produced wine for hundreds of years, and when we bought the place in 1995 there were still many ancient wine-presses in the out-buildings, one of which we have put on display at the top of the first staircase. Vignoble Vincent and Vignoble Favre, both on the island of Oleron, well worth visiting. Also the Vignoble Maxine Pinard right at the northermost tip of the island. Slightly south at St Dizant-du-Gua is the Chateau de Baulon – a wonderful mansion/castle to see too.